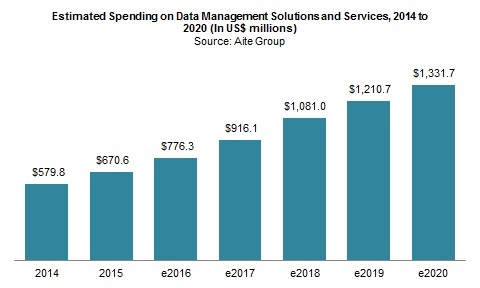 Investment in data management technology solutions will increase to US$1.33 billion by 2020—a 72% increase over 2016. London, 26 April 2017 – Mergers and acquisitions have dominated the traditional enterprise data management scene, but new entrants are focused on targeting specific demographics in the capital markets, such as asset managers or securities services providers. Solution vendors have also adapted their wares as the industry has evolved from data management technology as a solely IT-driven purchase to a more business- and compliance-led process. Without any one driver for investment into data management, this vendor technology universe remains a diverse one. This report highlights current and projected spending on data management technology and common business cases for investment. Based on 2016 and 2017 Aite Group interviews of individuals from 25 financial institutions to capture their views on the vendor community serving the data management and data governance function, it details 18 solutions on the market: AIM Software, Asset Control, Bloomberg PolarLake, Broadridge, Curium Data Systems, Datactics, Eagle Investment Systems, GoldenSource, Innovative Systems, IHS Markit, NeoXam, Orchestra Networks, RIMES Technologies, SAS, SmartStream, SS&C Technologies, Xceptor, and Xenomorph Software. It is the second in a series—find the first here. This 80-page Impact Report contains 64 figures and four tables. Clients of Aite Group’s Institutional Securities & Investments service can download this report, the corresponding charts, and the Executive Impact Deck. This report mentions AIM Software, Asset Control, Bloomberg PolarLake, Broadridge, Collibra, Curium Data Systems, Datactics, Eagle Investment Systems, GoldenSource, IBM, IHS Markit, Informatica, Innovative Systems, Kuberre Systems, MarkLogic, Microsoft, NeoXam, Oracle, Orchestra Networks, RIMES Technologies, SAP, SAS, SmartStream, SS&C Technologies, State Street, Tibco, Trillium, Wipro, Xceptor, and Xenomorph Software.